Watching the spectacular Kallimali view point is perhaps one of the most charming experiences at Munnar. Ragamaya resort in Munnar is the ideal cottage for you to experience the same. Watching the spectacular Kallimali view point is perhaps one of the most charming experiences at Munnar. If you are planning for a Munnar trip, never miss Kallimali, as it will offer you majestic distant views of the Ponmudi Reservoir, as well as the island in it, and its catchment areas, dense with forest. You may find some hotels and resorts in Munnar that offers places to catch this view point. If you prefer a more relaxing, romantic, and roomy experience, to enjoy Kallimali View Point,�Ragamaya Resort�could be your best choice. Situated amidst the green hills of Western Ghats, Ragamaya is the most popular luxury resort in Munnar. This vantage point is 4 km away from Rajakkad in Idukki district. It is not just a resort that will leave you with unforgettable memories but is also known for redefining lifestyles using traditional regimes of Ayurveda. Apart from the Kallimali view, you may also enjoy the caress of the pleasant breeze at this most famous resort in Kerala. Kallimali is a small Village in Rajakkadu Panchayath of Idukki District. Idukki is already a major tourist hotspot with popular destinations including Munnar, Thekkady, Ramakalmedu and Kundala. Still there are much more that Idukki has to offer. 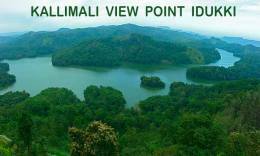 Kallimali View Point is one of such destination that offers lots of fresh air and beautiful view cherish all the time. The climate at the place is really awesome. Tourists can enjoy the beauty of Ponmudi in a good climate. Kallimali will be a perfect honeymoon destination and place for gathering with family and friends. It is also a fabulous place for those who enjoy trekking. Situated amidst the green hills of Munnar, near Kallimali View Point, Ragamaya is the most popular luxury resort in Munnar offering the best view of Kallimali. Ponmudi has a carpet of thick tropical forest that rolls down to the foot of the hill station. Get the perfect view for scenic splendor and natural beauty of Ponmudi only from Ragamaya Resort. The resort comprises of 20 guest rooms, out of 18 are well-appointed lake view rooms, one is honeymoon pool villa and the other one is a family pool villa comprising 2 guest rooms. If you are looking for some adventure activities to do in Munnar, you can find the largest adventure park in Kerala near to this resort. Rockhill Adventure Park in Munnar offers a range of adventure activities like Polaris ATV, Zipline, Tree Top adventure, Rock Climbing and more.